A Chinese People’s Liberation Army Navy (PLAN) guided missile destroyer and frigate have docked in Iran on Saturday ahead of a series of bilateral exercises, according to Iranian and Chinese press reports. 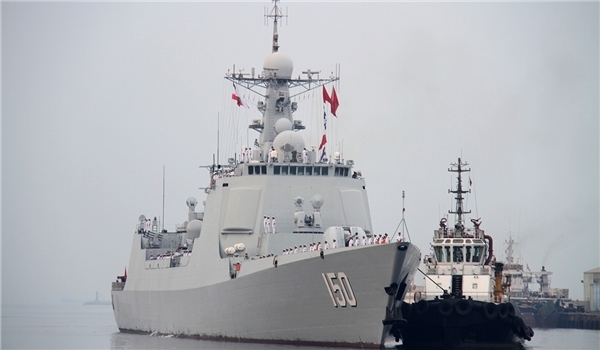 The Type 052C Luyang II destroyer Changchun and the Type 054A Jiangkai II frigate Changzhou docked in the Iranian port of Bandar Abbas on Saturday — a first for Chinese warships, according to a report in the state controlled Fars News Agency. “The voyage of the Chinese army’s fleet of warships for the first time in the Persian Gulf waters is aimed at joint preparation of Iran and China for establishing peace, stability, tranquility and multilateral and mutual cooperation,” said Iranian Navy Adm. Amir Hossein Azad on Sunday. The Chinese ships, part of the PLAN’s ongoing anti-piracy task force in the Gulf of Aden, made the port call ahead of a return to Asia. The ships are scheduled to conduct basic search and rescue (SAR) exercises with the Iranian Navy in the Persian Gulf starting on Monday. The port call follows a visit in May by the Iranian defense officials to Beijing where the two countries pledged to continue increased defense cooperation. “Beijing and Tehran share common views on several issues of international concern and China might have identified Iran as a potentially more stable pivot into the region, given how its decade-long investments in Middle Eastern countries such as Iraq and Syria have suddenly become uncertain in the current political climate,” according to a Monday analysis in Jane’s Defence Weekly. Iran and China have reportedly shared military technology since the 1980s but there have been few overt displays of military to military cooperation. One Iranian economist said the visit could be a hedge against warming relations to the West as more moderate political leadership has taken charge in Iran. China has a sizeable economic interest in Iran, which could be threatened by greater ties to the West. “It shows most of all that the Chinese want to keep their lucrative business relations with Iran,” Saeed Laylaz told The New York Times on Sunday.